← No Use Crying Over Spilled Milk…Why Not? Expectations vs. Law of Attraction…Who Wins? 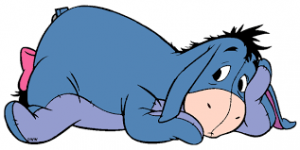 Do you remember Eeyore from Winnie the Pooh? He always was so morose and just unhappy. He never had any joy. He kept his head down and in that deep pitched, sad voice would say something kind of brave and pretty pathetic. He never expected anything from life and basically never got anything. Or at least he didn’t feel like he had anything. His expectation and what he was attracting were totally in sync. But have you ever heard someone say “I never expect too much so I’m not disappointed.” I’ve been confused by that for years. I mean, can you find happiness and joy in your life if you only have low expectations of people and situations? If the law of attraction really works, and you get what you put your attention on, then if you expect people who won’t be there for you, who won’t love you or stand up for you, a horrible boss, a bad landlord, a car that constantly breaks down, a spouse who doesn’t understand you, not enough money at the end of the month, or…shall I go on? What do you think you will attract? On the other hand, I’ve heard couples who have been together a long time saying they bring out the best in each other, and singles say that is what they are looking for in a partner. The law of attraction and what you expect in life, if in alignment, seem to go pretty much hand in hand. So maybe, just maybe, if you want more in life; more joy, more respect, and even more success or more money, it is better to focus on and expect the good in people. You can even take it to the extreme and focus on what you love about people, on seeing the best person they can be, on a car that runs perfectly and that bank balance that always has money in it at the end of the month. And then maybe, just maybe, people will start stepping up and when they are around you, they will be a better person, and life will start looking a little sweeter. How wonderful will you feel when someone says you bring out the best in them? You can smile and know that you expected nothing less. So answering the question, expectation vs. the law of attraction, who wins? It can be you!